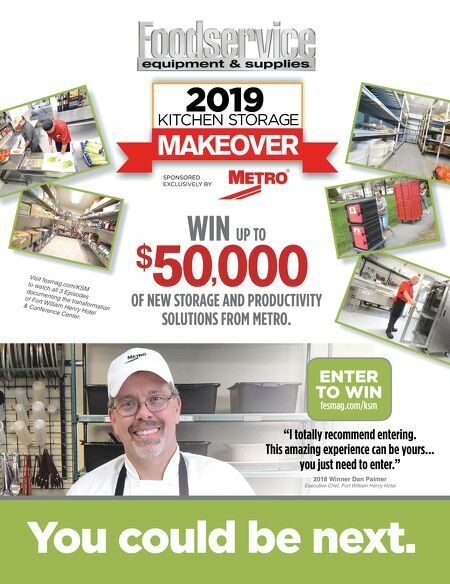 ● ● ● ● ● ● ● ● ● ● ● ● ● 62 • FOODSERVICE EQUIPMENT & SUPPLIES • OCTOBER 2018 The Club deli station features soups and sandwiches as well as housemade spreads, house-roasted local meats, fresh-baked breads and local cheeses. A cold rail holds ingredients. The station also contains a slicer, an upright refrigerator, a prep sink, and deli case holding local deli meats and cheeses, and composed salads. On the other side of the deli, staff prepare sandwiches made to order. Staff heat sandwiches upon request within 30 to 45 seconds in a high-speed oven. The Fields salad bar contains local produce, a plant- based protein such as quinoa, marinated tofu, house-made dressings and toppings. At one end of the salad bar staff have access to two induction cookers and a small cold well for making salads tossed to order. My Zone features foods free of gluten, peanuts and tree nuts. This self-service pantry contains a dedicated refrigera- tor, toaster, microwave, separate utensils and cutting boards and gloves. Simple Servings also caters to students staying away from the Big 8 allergens: eggs, fish, shellfish, soy, milk, peanuts, tree nuts and wheat. Staff use a slow cooker, five- gallon steam kettle, two steamers and a double-deck combi oven to prepare menu items here. The state-of-the-art interactive demonstration kitchen, Exploration Station, gives students an opportunity to prepare their own meals under the supervision of a chef. This station contains a four-burner range, a two-foot flattop, a combi oven, a two-basket fryer, a 20-gallon tilt skillet, induction burners (four are built into counters but the area can run up to 10), and a hot and cold holding table with recessed wells. Menu items include stir fries, seared salmon, build-your-own quesadillas and tacos, shrimp pad thai, omelets all day, break- fast sandwiches and pasta bars. "We serve breakfast and lunch to about 150 students each day here," Williams says. Nearby, Discovery Kitchen offers 90-minute formal and casual cooking classes on Tuesday afternoons and Wednesday nights. Up to 16 students can register for each class using UVM's guidebook app. "Many of the ideas for this teaching kitchen came as a result of our tour of Google's Mountain View foodservice with Helen Wechsler, regional food team manager for Northern California," Belliveau says. Rise and Shine features breads, bagels, rolls and pastries made at the commissary bakeshop on campus. The station features local coffee and other beverages, such as juices, milk and teas. Infused water stations sit at this station and others throughout the space. A soda machine sits near the bathrooms, with the intent that the less appealing location will discourage customers from taking soda rather than water. 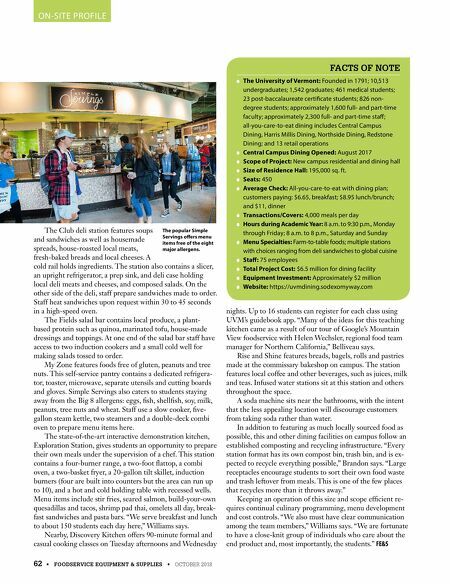 In addition to featuring as much locally sourced food as possible, this and other dining facilities on campus follow an established composting and recycling infrastructure. "Every station format has its own compost bin, trash bin, and is ex- pected to recycle everything possible," Brandon says. "Large receptacles encourage students to sort their own food waste and trash leftover from meals. This is one of the few places that recycles more than it throws away." Keeping an operation of this size and scope efficient re- quires continual culinary programming, menu development and cost controls. "We also must have clear communication among the team members," Williams says. "We are fortunate to have a close-knit group of individuals who care about the end product and, most importantly, the students." FE&S ● The University of Vermont: Founded in 1791; 10,513 undergraduates; 1,542 graduates; 461 medical students; 23 post-baccalaureate certificate students; 826 non- degree students; approximately 1,600 full- and part-time faculty; approximately 2,300 full- and part-time staff; all-you-care-to-eat dining includes Central Campus Dining, Harris Millis Dining, Northside Dining, Redstone Dining; and 13 retail operations ● Central Campus Dining Opened: August 2017 ● Scope of Project: New campus residential and dining hall ● Size of Residence Hall: 195,000 sq. ft. ● Seats: 450 ● Average Check: All-you-care-to-eat with dining plan; customers paying: $6.65, breakfast; $8.95 lunch/brunch; and $11, dinner ● Transactions/Covers: 4,000 meals per day ● Hours during Academic Year: 8 a.m. to 9:30 p.m., Monday through Friday; 8 a.m. to 8 p.m., Saturday and Sunday ● Menu Specialties: Farm-to-table foods; multiple stations with choices ranging from deli sandwiches to global cuisine ● Staff: 75 employees ● Total Project Cost: $6.5 million for dining facility ● Equipment Investment: Approximately $2 million ● Website: https://uvmdining.sodexomyway.com FACTS OF NOTE ON-SITE PROFILE The popular Simple Servings offers menu items free of the eight major allergens.